The 2016 edition of Loch Gorm is now available! Loch Gorm is located to the north of the distillery and is very dark and peaty in colour, similar to the dark rich colour of our sherry cask matured single malt. Loch Gorm has been part of our range since it was first introduced in 2012 and is the only release matured exclusively in oloroso sherry casks. 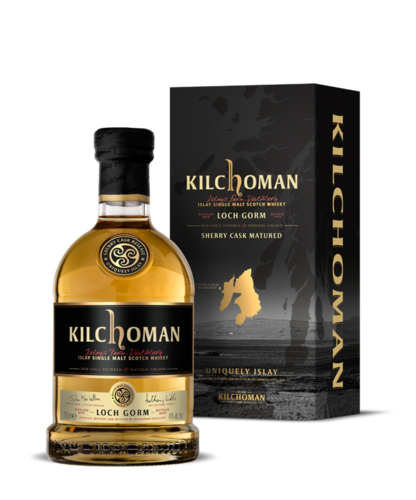 This edition of Loch Gorm is limited to just 17 casks worldwide and was selected from a combination of fresh and refill oloroso sherry butts over six years of age, the oldest release of Loch Gorm to date. The added maturation and combination of fresh and refill sherry casks provide a balance of powerful rich flavours, spicy notes and peat smoke. The updated packaging for the 2016 release features stunning views over Loch Gorm, just a short distance from the distillery gates. Colour: Peaty in colour, similar to the dark rich colour of the Kilchoman sherry cask matured single malts. Nose: Soft, spicy and rich with light smoke, chocolate and citrus fruit. Palate: Soft fruits and peat smoke.